ProSelect 2019r1 - What's New? This page cover all major changes - see this Knowledgebase article for all the details. You can use the hyperlinks in What's New section at the back of the ProSelect 2019r1 Reference Manual (quick access under the Help menu in ProSelect) to get to the relevant new or updated sections in the manual. ProSelect 2019r1 has a new logo and app icon! A special thank you goes to Cindy Behnke for allowing us to use her beautiful image in the new splash screen. ProSelect 2019r1 is now a native 64-bit application using the latest OSX API calls and ready to move forward with future versions of Mac OSX. Images and text are crisper on Windows computers which use high-resolution screens (such as the Microsoft Surface Pro range). This also resolves some issues with Mirror Display Area window placement and sizing on Windows 10 when you are using dual screens with a mix of standard and Hi-DPI screens at different scalings. 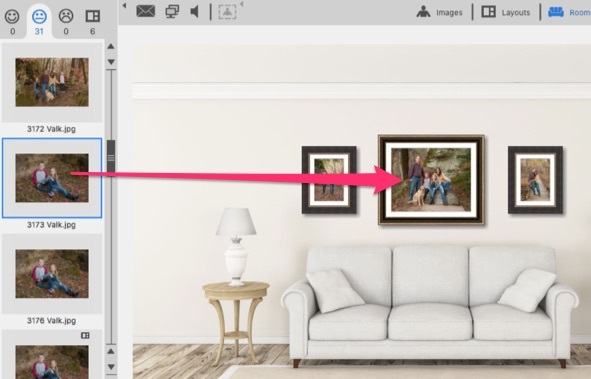 After adding and sizing a print in room, you can now drag and drop another image from the image list onto that print and the new image will replace the existing one complete with any applied surrounding mat or frame. The newly used image will be automatically duplicated if it has been ordered, used in another room or already had a different frame or surrounding mat applied. If the new image has a locked crop ratio, it will be sized to match the previous image however its locked aspect ratio will be maintained. The B&W local effect now offers finer adjustment of this effect with new Brightness, Contrast and Skin Boost controls in the Preferences. This enables you to set up your preferred B&W "look" and quickly apply or remove this effect from any images. You can now also choose one of the selected images in the currently open album file when previewing your effects setup in Preferences. The Sepia local effect in earlier versions has been replaced with new Special Tint effect which provides the full spectrum of possible tint colors. 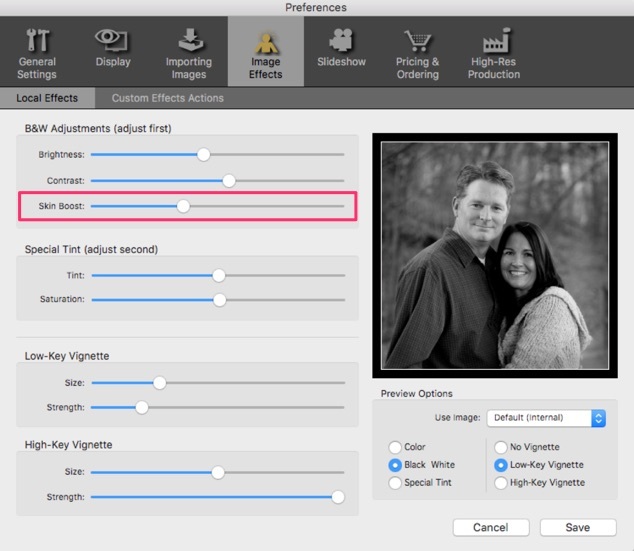 Use ProSelect's built-in Local Effects or your own Photoshop Actions (via ProSelect's Custom Effects Actions) to preview your B&W and Special Tint artwork during the sales session. Now, during production, you can manually prepare your ordered custom images and insert them within the normal High-Res Production workflow by simply saving them with a "_BW" or "_ST" suffix to their original file name. Production will automatically look for and use that file instead when building your final sized products. 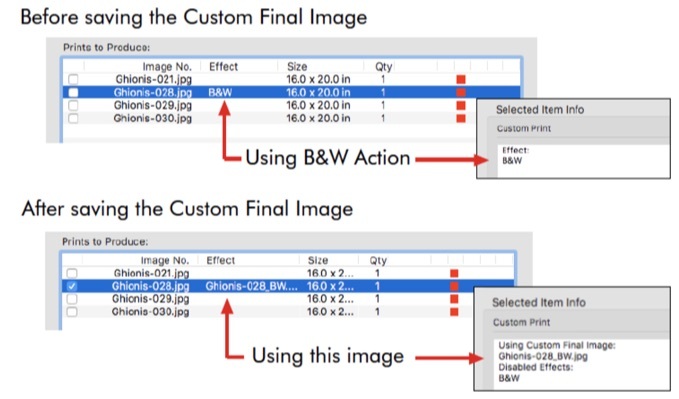 Custom final images can be saved as jpg, tif or psd file formats. 1. When ordering an image with a Locked Crop ratio in the Place Order window, ProSelect will now try to find and select the closest matching price list item by first matching the long side of the last display size against print price list item sizes (or next largest size) then match closest print area equal to or greater than area of image. 2. When opening Custom Product window for Prints, the Custom Crop option is automatically pre-selected with the dimensions of the last display size pre-loaded into the width an height boxes ready for you to order at that size using the closest price from your price list. 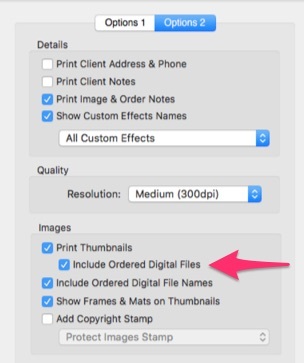 Thumbnail images for your ordered Digital Files can now be optionally included on Order Report printout. If you have a large number of digital file orders, you can alternatively use the new Ordered Digital File Report for a more compact printout. In either case, you can protect your images by selecting to have a copyright stamp added to each image on the report. In Working with Books, you can now rotate a page regardless of the aspect ratio of the book in most cases. See page 151 of the ProSelect 2019r1 Reference Manual for the few cases where you can't do this. 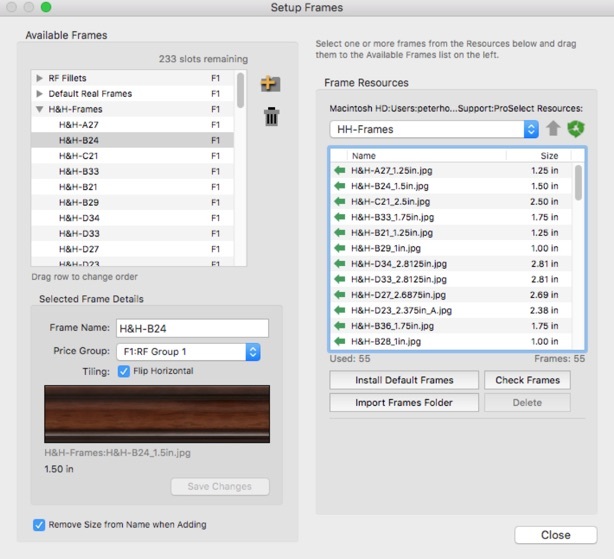 Frame Groups are now supported in both ProSelect Basic and ProSelect Pro. The Setup Frames window includes more information on the number of frames available and being used. When your favorite Frames supplier updated their frame range, it's now its easy for you. Just download and install the new folder of frames. If that same frame folder already exists in the ProSelect Resources folder, you are asked whether to replace it. In doing so, any frames in the existing folder that are no longer in the new folder are moved to a "Discontinued" folder and are also automatically removed from the Available Frames list so you won't accidentally order a frame that's no longer supported. If you are storing your original image files in the shared location such as on a network server, you can now setup ProSelect to save the links to those images as relative to either the saved Album file location or relative to the Default Starting folder (as setup in ProSelect's Preferences). Using one of these relative location options will allow different computers (including a mix of Mac and Windows machines) to directly access the original images from any location. Finding your missing original images is now fast and easy using the new Find Original Images window. The window lists all missing images (with a red mark) from either the entire album file, just the ordered images or only the images used in a book. You can see all the missing images and where they were last located. 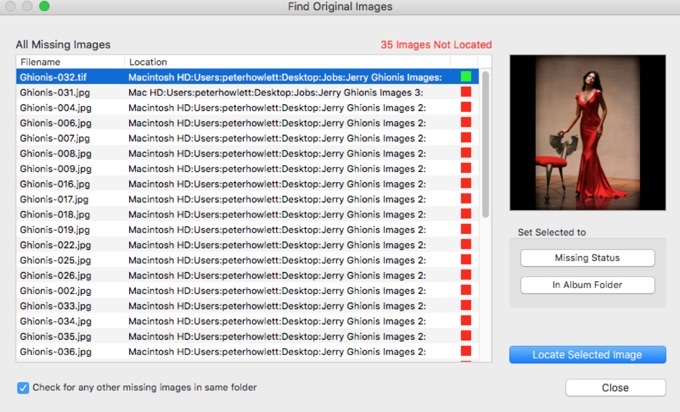 By default, locating one image will check if any other missing images are in the same location and automatically locate those as well. Opening the window while holding down the SHIFT-Key will force a re-link even if the images can be found from the machine you are using. Use this option to force a re-link to your original files if you have copied them or you are changing over to use one of the new relative path options (see above). The auto-backup option no longer saves the backup into the Album file itself rather the backup data is saved on your local computer's hard disk. This means that auto-backups will now still work when the current album has been opened across a network and the network connection fails. When re-opening an album, ProSelect checks if there are unsaved changes for this album in this location on YOUR computer and asks if you wish to recover them. ProSelect 2019r1 registration keys now start with PSV6- or PST6-. If your license is valid for this release, your updated key will be automatically downloaded when you use the On-line Registration option. Alternatively, you can collect your new key from under the My Products tab in your My Account area on Timeexposure.com. ITPC Data on original images is now preserved when creating final print images and digital files through High-Res Production. Added the option to the Preferences (General Setting -> General -> General Default -> On Album Open) to automatically check that all original files are available when opening an album file. You can use this option on your production machine to quickly check the availability of your original image files. In the High-Res Production window, if you have selected Photoshop as your RAW image editor in your Preferences, then you can Alt/Option click on the "Open RAWs in" to open the selected RAW images in Lightroom and vice versa. Added Show in Finder/Explorer button to the High-Res Production window. This will show the folder containing the selected image. When exporting a Production package with included images, ProSelect now checks that all the images can be found BEFORE the exporting. If some are missing, you can immediately open the new Find Missing Images window to locate those images. When Exporting a Production Package, if you have added any images with the same filename from different folder locations into the same album (such as having a folder of re-touched images with the same name - not recommended by the way!) then rather than export both versions of the image into the same export folder (and overwriting one of them), all images are now saved in separate subfolders within the exported production folder. The subfolder names match the parent folder for each image. The image locations in the associated production album are changed to reflect exported subfolder locations. You can now do a Save As if the album you are using has forcibly been "taken over" by someone else in your studio. You get to keep your changes and they keep theirs. The Print Paper Sizes window now can sort paper sizes by those used in the Price list using the Sort By button. You can use this to gather un-used sizes together for removal. In the Price List & Products window, after entering a new price, if you click on the Save button while holding down the Alt/Option key, then that price will be applied across all of your price lists. When re-importing a Collection, you can now resolve conflicts with existing items in the import window by selecting to Add or Replace. When the Add option is selected, the new group name has the current date appended to its name (in YYYYMMDD format) so you can easily find the new group after it has been added. When importing a Collection in the new format, BEFORE importing, ProSelect now automatically saves a backup copy of the ProSelect Data file in the format "ProSelect_Data_TPK_YYYYMMDD_HH:MM.xml". This allows you to recover back to your configuration before the import using the Shift-Startup option and selecting to recover from this backup file. All new releases are free to everyone whose TimeExposure PLUS (formerly SUPPORTPlus) is current on the official release date. 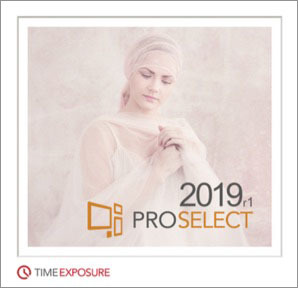 If your TimeExposure PLUS has expired, then as a registered ProSelect user, you can upgrade to the latest version at a significant discount through the ProSelect Upgrade page.